How dare Trader247 accuse my hero of using deliberate typos! He's just jealous that my hero is illiterate and couldn't spell correctly if his life depended on it. Did I do right master? Will your specialness rub off on me? I most certainly am not illiterate! My parents had been married to each other for a good 16 months before my arrival! The four NBA Play-offs yesterday split on the Under / Over. Three of the favourites failed to cover, and two actually lost. We have a rare Play-off Blunders selection today, with the Golden State Warriors -14.5 v Portland Trailblazers but this is not a typical Blunders selection - these two teams met in the Second Round last year, with the Overs resulting in four of the five matches. My alma mater recently held its 100th annual Founder's Day Supper and Annual Reunion - ~229 old boys, in some cases very old boys, and ~17 females. One downside of attending an all-boys school is that the count of females at these events is always rather limited. Attendees are invited to include their profession, and most are indeed professions. 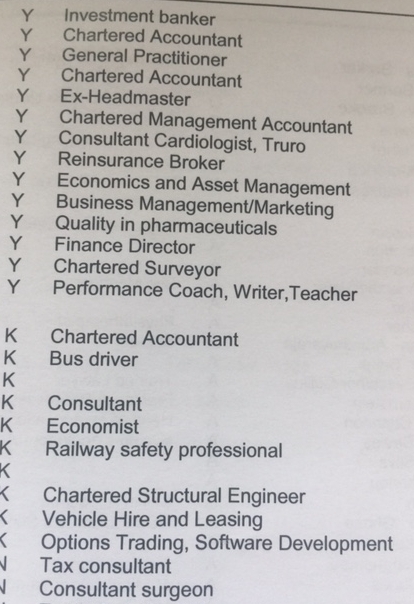 Interestingly, not one job description includes sports trader or professional gambler. 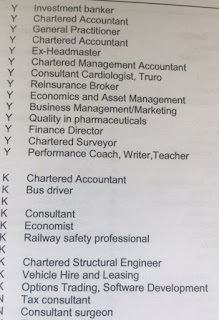 There was one Options Trading entry among an abundance of Chartered Accountants, Bankers, Doctors, Engineers and Finance careers, and one stand out job of Bus Driver. One can't help but want to find out more details on that story! Should I attend next year, I may have to liven things up a bit with my job description. Back to my school days, and I was rather fortunate in that Founder's Day was the same day as my birthday, so all through my secondary school days, I either had the whole day off school, or as a sixth-former had to attend church for an hour with the rest of the day off. I timed my arrival to perfection.